NEWPORT, Vt. (AP) — A Vermont school district superintendent says a high school is closed due to a "credible threat." MONTPELIER, Vt. (AP) — Vermont Gov. Phil Scott has announced $100,000 in grants to two communities for outdoor recreation. NEWPORT, Vt. (AP) — Police and bank officials in Vermont are warning residents to be wary of counterfeit bills. PROVIDENCE, R.I. (AP) — A Massachusetts man who robbed a Rhode Island bank has been sentenced to four years in prison. NEWPORT, R.I. (AP) — A Rhode Island nonprofit that helps veterans says it's moving its memorial to U.S. service members killed in action. NEWPORT, R.I. (AP) — Officials from the National Sailing Hall of Fame and the city of Newport expect to finalize the sale of most of the municipal Armory later this month. NEWPORT, Vt. (AP) — There is less than one month left to guess how long the ice will last on Vermont's Lake Memphremagog. George Mendonsa's daughter says her father died Sunday after he fell and had a seizure at the assisted living facility in Middletown, Rhode Island, where he had lived with his wife of 70 years. He was 95. NEWPORT, R.I. (AP) — Rhode Island lawmakers have filed a bill to create a commission to oversee a study of the state's natural gas and electricity system following a weeklong natural gas outage. NEWPORT, R.I. (AP) — A man charged with assaulting a teacher who tried to block him from forcing his way into a Rhode Island high school's gymnasium has pleaded no contest. The Newport Daily News reports that 23-year-old Marcus Schlip was sentenced to three years of probation on Wednesday after entering his plea to charges of assault and disorderly conduct. NEWPORT, R.I. (AP) — A Rhode Island business is closing permanently and the owner is blaming the weeklong natural gas outage that affected the Newport area. Tim Johnson says he had to close his free-to-use Kid Corner children's play space in Newport after a burst pipe during the gas outage cased significant damage to the business. NEWPORT, R.I. (AP) — Residents and businesses in Newport have filed class action lawsuits over the natural gas outage on Aquidneck Island. Lawyer Brian Cunha filed two lawsuits Monday against National Grid and pipeline operator Enbridge Inc.
One lawsuit was filed on behalf of eight residents and the other on behalf of three businesses. NEWPORT, R.I. (AP) — The state of Rhode Island is offering emergency loans of up to $25,000 for businesses that had to close because of a loss of natural gas service for a week. Gov. Gina Raimondo announced the program Monday, saying "being without a week of revenue is very difficult." NEWPORT, R.I. (AP) — Officials say Newport's courthouse will remain closed Monday as efforts continue to restore natural gas service to homes and businesses. The Murray Judicial Complex was among many institutions shut down last week after National Grid shut off service to parts of Aquidneck Island following a potentially dangerous loss of pressure caused by a supplier's faulty valve. National Grid said that 80 percent of Newport customers had their service restored as of Sunday morning. NEWPORT, R.I. (AP) — Utility company officials say they have restored gas service to more than 5,100 customers in Newport. National Grid says that 80 percent of the roughly 6,400 impacted Newport customers have had their meters turned back on and their gas appliances re-lit as of Sunday morning. National Grid suspended service to parts of Aquidneck Island on Monday following a potentially dangerous loss of pressure caused by a supplier's faulty valve. NEWPORT, R.I. (AP) — Gov. Gina Raimondo says the state has opened an investigation into a natural gas outage affecting residents and businesses in Newport and Middletown. The Democratic governor told WPRO-AM on Friday that the Public Utilities Commission is conducting the investigation to figure out whether National Grid was responsible for "causing this crisis." NEWPORT, R.I. (AP) — National Grid says it's working to shut off natural gas to customers in Newport so they can repressurize the system. The utility suspended service Monday following a potentially dangerous loss of pressure caused by a supplier's faulty valve. Chief customer officer Terence Sobolewski said Thursday that about 6,250 of 6,500 Newport customers have had their service suspended. He says every meter must be off before they can repressurize, then restore service. NEWPORT, R.I. (AP) — Officials with utility National Grid say they're making good progress restoring natural gas to thousands of Rhode Island customers who lost service during the coldest day of the year. National Grid's chief customer officer, Terence Sobolewski, said as of mid-day Wednesday the utility's door-to-door effort to shut off gas to customers in Newport and Middletown had reached about 5,900 of the roughly 6,800 customers who lost service. National Grid President Tim Horan has been hospitalized after suffering a medical emergency at the podium during a news conference on the gas outage in Rhode Island. Horan and Gov. 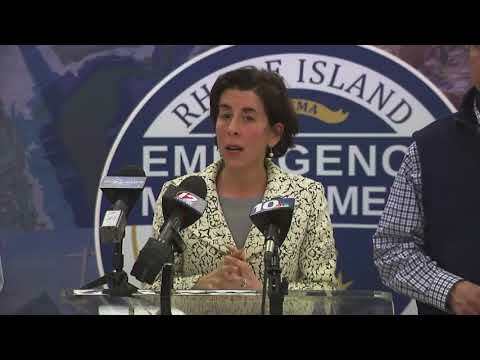 Gina Raimondo had been addressing the media late Tuesday evening when Horan collapsed. NEWPORT, R.I. (AP) — Officials from Mystic Aquarium in Connecticut say a juvenile harp seal who spent the weekend on a Rhode Island beach apparently was just resting. Sarah Callan, assistant manager of the animal rescue program at Mystic, says officials had been monitoring the seal after it was spotted Saturday on Easton's beach. JAY, Vt. (AP) — Vermont State Police say rescue crews found a skier missing for four hours safe deep in the woods. Officials say 69-year-old Robert Staniforth, of Newport, was found Thursday evening by members of the Jay Peak Ski Patrol. The Caledonian-Record reports medical personnel evaluated Staniforth and found him in good health.